It’s traditionally about romance, but Valentine’s Day is a great opportunity to shower the whole family with love. These days, Valentine’s Day is less fancy dinner by candlelight and more being covered in tomato sauce by three other objects of my affections. But it’s still a good excuse to indulge in some nice food and good, heart-shaped fun. Here are some ideas to celebrate Valentine’s Day, with all the loves of your life. Heart-shaped love notes – write what you love about your children on a bunch of heart-shaped sticky notes, then stick them on their bedroom door for them to find when they wake up. You could do a theme like, “reasons why I love being your mummy” or “my most fun memories with you this year”. They’ll go to school knowing they’re amazing! Enjoy a Valentine’s Breakfast – Anything red (strawberries, raspberries, watermelon, jam, etc) or heart-shaped (cut pancakes, toast or fruit with cookie cutters) will look fab, then bring out the squirty cream or chocolate chips for a special treat! Do a good turn – Spread the love by asking your children to do a good turn. It may be taking flowers or chocolates to a neighbour, donating pocket money to charity, taking old toys to a charity shop, anything they like. Make a card – And ask them to make you one too! 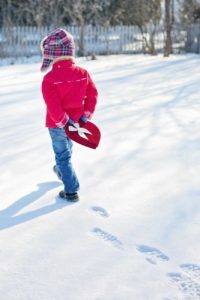 Have a family crafting session where you all make each other cards, or Valentine’s crafts such as salt dough hearts (there are lots of other ideas on Pinterest). 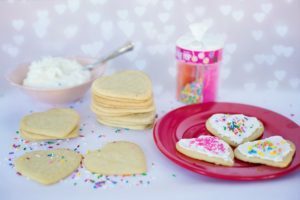 Bake – Let them help you bake a heart-shaped cake (pink batter!) or heart cookies with lots of sprinkles. Heart rice crispy treats would be an easy one with very small children. Heart-shaped pizza for tea – make your own dough and shape it into hearts, then let everyone pile on their own sauce, cheese and toppings. You could decorate the table with Valentine’s Day decorations, and make paper chains for the walls. Have a family date night! It’s wonderful to dress up and have a fancy night out with your other half, but if you don’t have a babysitter, why not make it a family affair? Go out for tea, or just for dessert! Or go to the cinema, or for a walk or swim after school – something the whole family would enjoy! Start a reusable Valentine’s card – Buy a card for each child and bring it out every year with a new line written in it about what you love about them. I think this would be really nice for your partner too! Give love coupons – This is definitely something they could reciprocate. Make little vouchers for special treats or activities for your kids. Movie nights, takeaway tea, anything you know they would love and you’re willing to do!